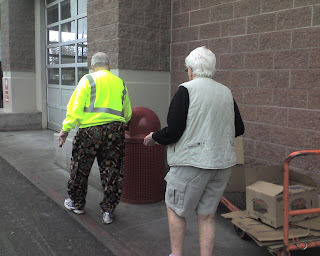 Excuse me while I take a break from the Artfest love, so I can show you the random weirdness we encountered yesterday during our shopping trip to Costco. They came to Costco in this demure little putt-putt. 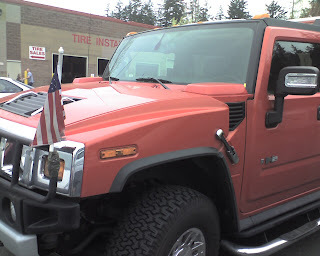 Yes, it's an H2 Hummer. With flags on every corner. Because toxic orange cars are so hard to pick out in the parking lot. Oh, but the madness doesn't stop there. It stops at this house and the accompanying car. We've seen this geodesic dome-style house before, and I like that it's such a throwback to the 70s. 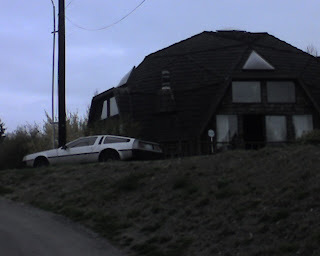 But I almost choked on my own spit when I saw the deLorean parked outside. All they need is the Back to the Future theme blaring from loudspeakers.